89 Massachusetts towns have already updated the name of their top elected body from Board of Selectmen to Select Board. All five of Winchester's current Selectmen support this change. Winchester Town Meeting has already voted with nearly unanimous support to make this change. On March 27th, 2018, Winchester voters will go to the polls to vote whether to support it as well. Vote March 27, 2018 7 a.m. to 8 pm. Shall this Town of Winchester approve the amendments to the Town of Winchester Home Rule Charter recommended by the 2017 Fall Town Meeting summarized below? Sample text to send your friends and neighbors to encourage them to get to the polls to vote YES. 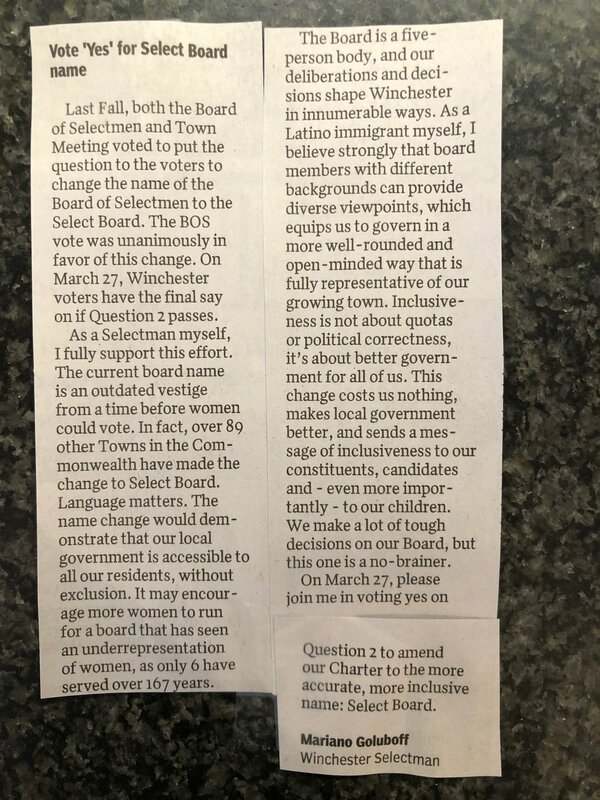 On March 27th, I'm voting YES on #2 to update the name of our Board of Selectmen to Select Board. This is a change that 90+ other towns have already made in our state. Town Meeting already voted to approve the update with resounding support in November. Now, it's up to all Winchester citizen to voice our support. Please join me in voting YES for Select Board. March 27th, 2018, 7 a.m. to 8 p.m.
Out of town? Go to the Town Clerk's office before 3/26/18 at 12 noon to vote by absentee ballot.